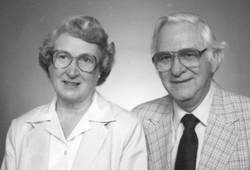 Although Harold, a much loved professor of business and economics at Ashland University, passed a way many years ago, his legacy continues to this day through the generosity of his loving wife and widow, Mary Alice. Professor Mielkes acuity in the classroom was able to be translated to that in real life through sound investment planning. And through wise estate planning, Mary Alice has not only added a charitable remainder trust (with Ashland as the beneficiary), on behalf of her sister, Norma Dafler, but set up a fully functioning endowed scholarship program in honor of Harold. Mary Alice has decided that planned gifts sometimes mean gifts that arrive now. After consulting with The Legacy Estate Programs office and her advisers, she chose to further honor Harold and express her own support for the Building on Strength Campaign by reserving a spot in the new Business and Economics building. And, there are plans to see Ashland benefits even more through her estate plans with a bequest. Mary Alice and Harold - what a wonderful example of good planning and generosity.